I want to start by saying that I am not here to bash men or be a mega feminist. I am simply here to state some of my personal anxieties on the river that involve confidence issues when it comes to fishing with others, men and women alike. I believe other women anglers may find this relatable as well. Fly-fishing with genuinely good people. Laughs, encouragement, and lots of high fives! I think confidence will be a constant battle I will have to face in life and on the water, but what I do know is that if I choose genuinely good people to fish with then there is no judgment and there is only help and encouragement. 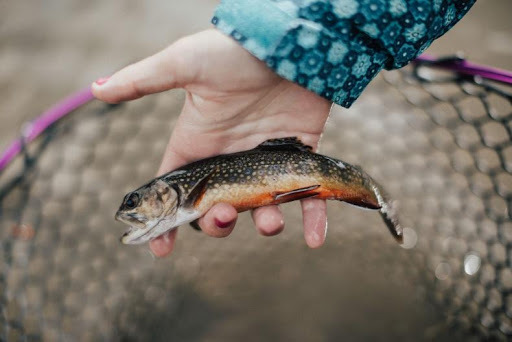 If you choose to fish with egotistical and stuck-up people then that’s where confidence starts to break down and so may the passion for fishing as well. For me I know that my shorter casts still reach deep holes that produce large fish, getting tangled only helps me learn to untangle faster and snagging trees every once in a while, is just downright hilarious. Everything I do makes my fishing game unique and that much more special when I catch fish and I should be proud of that. As a female angler, I hope that I can block out any negativity that is thrown my way and just continue to work on myself and know that I will not let a single person ruin my passion for such an incredible sport. 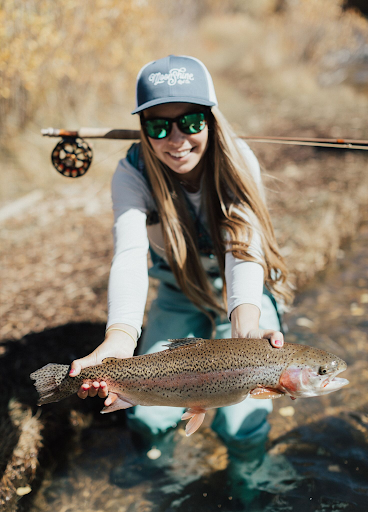 It’s common sense that fly-fishing is a male-dominated sport, however, women anglers have been steadily increasing with the times and I am here for it! This still doesn’t eliminate some of the issues that come with being a women angler. For me personally, I have some confidence issues in general. The question “am I good enough?” is usually a pervasive thought inside my head daily. This question follows me everywhere and especially in fly-fishing. Can I cast far enough? Do I catch big enough fish? Do I catch enough fish? Am I as good as other people? Questions like these make me wonder if I can fish with other people, or if I can keep up with them. In this day and age social media is highly prevalent in our lives and has made a huge impact in the fishing community. We typically share our biggest catches and best days, what I like to call the highlight “reel”. I can honestly say that I am guilty of the same. I don’t typically post the tree I snagged, the six knots I had, or the rock I snapped off on, but I will post the one fish that I caught after all that. I think this gives me, and perhaps others a false sense of security and so when we go to flyfish with others they are expecting us to be just as amazing as our Instagram feed and only catch the big fish we post, but when we catch our own shirt will they judge us? It’s a thought I get every time I’m invited to fish with someone new: “will they judge me?” I especially get this when I am fishing around men. They cast so far and seem to do so effortlessly, while I think I cast so mediocrely compared to them. Typically, the men I fish with are amazing, but it’s the random guy on the other side of the river that asks if it’s my first day on the river or if I’ll guide him in a bikini that really gets to me. It’s the guys that crowds my hole because hey I’m just a girl who doesn’t even actually fish anyway so why does it matter. With exception to a few bad apples, what I’ve come to realize is that most people, anglers alike, only focus on themselves, bettering themselves and their fly-fishing efforts, which is where my head should also be. Not worrying about what other people think and simply focusing on my game. It’s easier said than done though.